Cleanse. Foto von Barry Silver, Flickr. Writing about and researching the chilli in China, I continue to be fascinated by its appearance in the Himalayas – and in “folk” medicine, ancient and modern. In the USA post-2000, hot peppers have surfaced in a health recipe that is supposed to rid the body of toxins and promote better health. It was to be taken with honey and butter. The interesting thing is that both recipes/prescriptions sound somewhat similar, combining a source of sugar and chile pepper, yet the one makes some sense in its health context, the other only in terms of slightly insane health/diet psychology. The “master cleanse” as a juice fast makes little nutritional or (other) physiological sense. “My” disciplines do make me interested in the cultural background and ecological connection, though – and there’s probably a history of belief in “sludges” accumulating in the “furnace” of the digestive tract and having to be cleaned out in order to “detoxify” the body, just waiting to be written (if it hasn’t been already). At least when it comes to the brain, we’ve advanced to computer metaphors at least; when it’s about the (other part of the) body, we’re still stuck in industrial metaphors, it seems. Also, the popularity of such practices seems to hinge on the popularity of their proponents. If Hollywood or other superstars say they do The Master Cleanse, it’s got to be good, right? I wonder, though, if the rising popularity of hot sauces and foods in the USA has also contributed. Anyway, there certainly is quite some psychological / cultural background to the whole issue – and much less of a truly medicinal (or even nutritional) sense. And the Himalayan recipe? Why do I think that this makes sense? Well, a diet rich only in some kind of grain, but especially in rice, may lack vitamin A and possibly C, which the chilli is rich in. So, this may help already. Add in the sugar in the honey, which is likely to have been a rare treat, and the boost of energy it provided is sure to have been a welcome help, too. 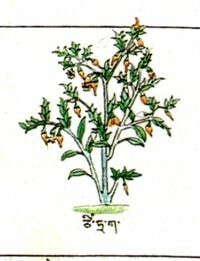 Butter, as present also in Tibetan butter tea, also provides a lot of energy, in its case from fat. The combination of honey and chilli may also have provided some antimicrobial effects which would have added to the benefit of this concoction; especially in the context of “combating phlegm”, associated as it is with sore throats and mucus in the respiratory tract and/or feeling rather lethargic, the effects of antimicrobial properties, a sugary-fatty energy boost, and the felt ‘kick’ of chilli work together well. So, psychology does certainly come into play here as well, but there are some conceivable medicinal/nutritional properties at play, not just an obnoxious taste and a belief that what stars propose must be good.